Featuring Long Range operation, Dual Channel aptX Low Latency and 3.5mm or Optical audio connections; the Miccus Home RTX 2.0 is the hub for your home audio. In RX mode, the friendly voice prompt guides you through the process which means you won’t get stuck not knowing what to do. Our Home RTX 2.0 integrates seamlessly into your entertainment system making it the perfect choice for all your wireless audio. Pair it with the Amazon Echo (Alexa) or Google Home personal assistant speakers. With the 2-in-1 flexibility of a Transmitter or Receiver the Home RTX 2.0 makes it easy to add multiple long-range Bluetooth audio links to your home setup. 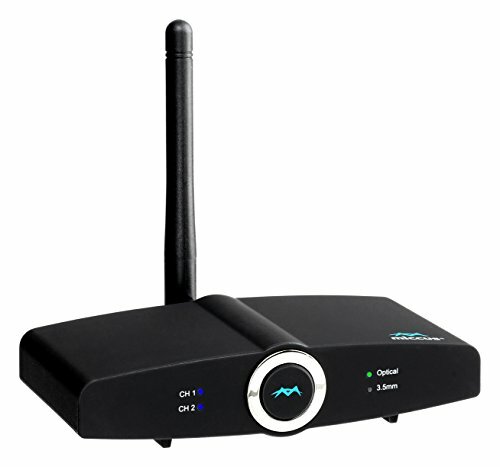 Quickly transform your TV, Speakers, Home stereo, Bluetooth Speakers, Bluetooth headphones and more with long range Bluetooth audio connections! * Audio codecs: SBC, AAC, aptX, aptX-LL, (NOTE aptX-LL use requires both devices in a pairing to support the aptX-Low Latency codec). * 3.5mm Stereo Audio Input and Output, TOSLINK Digital Optical Input and Output. * Operating range: up to 160ft (50M), Operating Frequency: 2.4 GHz. * 2-Year No-Hassle Replacement Warranty. We stand behind our products. Contact our in-house customer service at +1 (616) 604-4449 and we’ll get you squared away quickly. * Friendly and knowledgeable - If the need should arise; our Customer Support Reps are Americans who speak and write English and are happy to work with you to solve a problem. * Support by phone available Monday-Friday, 11am-4pm EST +1 (616) 604-4449; email Support at Miccus with the usual commercial extension. 24 hours or less response time. EASY TO USE & UPGRADED - Plug, pair, & play. It automatically reconnects on the next use. Upgraded: Improved for better compatibility with Bluetooth devices. Audio cables are gold tipped for cleaner, premium sound and longer (1m) for easier setup.